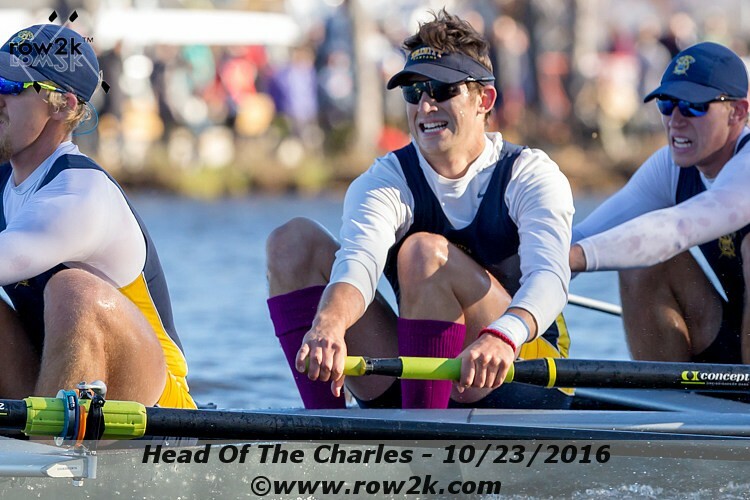 This week's row2k Interview is with Navy senior captain Caleb Robertson, who suffered a serious military training injury in the fall of his junior and has rehabbed his way back to being a major contributor to the Navy Heavyweights. row2k - You started rowing as a walk on at Navy, what was your athletic background prior to arriving in Annapolis? Caleb Robertson - During high school, I ran cross country, swam, and played lacrosse. While I was fortunate enough to be captain of the cross country team, there was no way that I was fast enough to run in college. My cross country coach, Phil Lyman, had rowed for Princeton and told me that he thought I should give rowing a shot in college. At this point, I had already been accepted to the Naval Academy, so I decided to try to walk on the team at the beginning of my freshman year. The spring before I graduated high school, Coach Lyman got me on an erg for the first time and helped me learn basic technique. I was hooked the first time I got to go out in a Navy shell, and I’ve been a proud member of the team ever since. row2k - You suffered a fairly unusual injury last season, tell us about that. Caleb Robertson - So in October of 2016, I was participating in some military training and had to be rushed to the hospital for emergency surgery. Over the course of the training, I had developed severe rhabdomyolysis, as well as compartment syndrome in my left leg. Rhabdomyolysis is caused by extensive breakdown of muscle tissue and its release into the blood stream. When the concentration of the proteins released gets too high, it overloads the kidneys and can lead to organ failure and death. By the time I got to the hospital, my urine was the color of red wine and I had a lot of trouble moving any of my limbs, which were not good signs. I found out later that my blood toxicity was well within the “fatal” range where total organ failure happens, so I’m glad that I’m even here right now. While that was an urgent situation, I had to go into surgery because I had also developed compartment syndrome, which was caused by pressure buildup within the muscles of my leg as a result of over-exertion. Because my muscles had swelled up so much, they were blocking most of the blood flow to my leg from the knee down, which in turn increased the rate of muscle tissue death. My little brother told me later that when he first got to the emergency room to see me, one of the doctors pulled him aside and told him that it was likely they would have to amputate my leg. Fortunately, they were able to save my leg by cutting two 8 inch incisions down each side of it and inserting tubes attached to a special vacuum that would relieve the pressure and remove the dead muscle tissue that had accumulated. They had to leave the incisions open for over a week as my leg flushed. To help normalize my bloodstream and restore full kidney function, I had to have four IV bags at a time pumping me full of fluids. For a few days, my kidneys were not able to produce enough urine to compensate for this aggressive fluid replacement treatment, so my body swelled up and some of my visiting teammates told me I looked like the Michelin Man, which I thought was pretty funny. All in all, I had to have 4 surgeries on my left leg before I was discharged from the hospital. My doctors told me that I was very lucky to be alive. row2k - What was the rehab like and at what point were you able to get back in to a rowing shell? Caleb Robertson - Before I say anything about my own rehab process, I have to say how instrumental my teammates were in helping me get better. Every single day while I was in the hospital, I had multiple guys come visit me. In addition to hanging out with me and helping get my mind off the pain, they really helped my parents out and always offered to help out with whatever they could. When I was recovering at home, guys took hours out of their day to come over and keep me company, which made me feel physically better. I think there really is something special about our team, and I don’t think I would have recovered nearly as well without them. Rehab was tough. Even now, almost a year and a half later, I am still doing regular physical therapy. Because the incisions on my leg had to remain open for a while, any movement caused pretty severe pain that I could feel even when on powerful pain meds. I had to stay still in my hospital bed for a couple of days after they stitched up my leg, just because of the size of the incisions that had to heal. Once the stitches had been in for a couple days, I was allowed to hang my leg vertically off the edge of the hospital bed, and eventually I was able to practice getting in and out of a wheelchair from my hospital bed. Over the next couple months, I had to learn how to walk again. After a couple days of being able to move around with a wheelchair, I “graduated” to a walker. I think I was only able to take like three steps with it on the first day before I had to get back in the wheelchair. When I moved out of the ICU into a regular hospital room, I was able to use the walker a little more. I set little goals for myself, and I was pretty pumped when I was able to make it from my hospital room to the end of the hall and back. After the walker, I started to use crutches, and I was able to work my way up a flight of stairs after some practice (I was also promised a bacon cheeseburger if I made it up, so that probably helped). When I finally came back to school, I was able to crutch around well enough to go to class and watch my team practice. I only got to row in one fall race before my injury, but I was very happy to be able to go up and watch my team compete in the Princeton Chase. While I had made some fast progress in the first stages of rehab, working my way up to walking without crutches took a long time. Because the muscles in my leg had been so messed up, I had lost nearly all range of motion in my calf and ankle by the time I got out of the hospital. I was only able to move my foot about half an inch in any direction, so a lot of my physical therapy was slowly getting that mobility back. One day I jokingly hopped on an erg and wasn’t even able to get up to quarter slide. Little by little, though, I got most of that range of motion back. By the time school let out for winter break, my doctors had cleared me to do very light steady state on the erg, which was awesome. At that point, I still wasn’t very good at walking, but it felt great to know that I was making progress. Instead of having to sit back and watch my teammates erg, I was now able to erg a little too. By mid-January of 2017, I was pretty close to walking normally and able to do longer steady state pieces. At the end of February, I was finally cleared to do test pieces and start practicing normally with the team. The first time I was able to get back out on the water in a shell was February 25th, and I remember being absolutely thrilled. It didn’t matter that I was in one of the lower boats, I was just pumped to be on the water with my team again. I knew I had a long road ahead of me. By doing steady state, I was able to get back into decent shape, but I had missed most of our winter training season and would be going into our spring break training trip with only one 2k under my belt. I decided to go into the trip just trying to have as much fun on the water as possible. I knew that I came close to never being able to row again, so I treated every day on the water as a gift and just tried the best I could. During the season itself, I took the same approach. Obviously, my goal was to race in the upper boats on the team, but I stressed a lot less about where I was in the lineups and just tried to focus on making the boat I was in go fast. row2k - You ended up making the 2V for the spring, what did you learn from the injury/rehab to make you a better rower? Caleb Robertson - I think the most important thing that happened after my injury was that it really pushed my focus outwards. My injury humbled me in a pretty big way. While I was in the ICU, I was kind of helpless: I had to rely on someone else for pretty much everything. I couldn’t get food by myself, I needed someone constantly checking my vitals/blood toxicity levels, I couldn’t walk around, bathe, change my socks, or even go to the bathroom by myself. Seeing the amount of people that rallied around me was very surprising. I knew that I was close friends with my teammates, but when you have a couple of guys that spend around 5-6 hours every single day sitting in a hospital room with you, it puts a whole new meaning on the word “friend”. I also had a lot of people praying every day for me and sending their encouragement. My parents pretty much dropped everything and took alternating 12 hour shifts in the hospital room with me, sacrificing time and a lot of sleep just to be with me. Seeing all this, coupled with my complete recovery, strengthened my faith and made me more able to reach out to other people. When I got back into a rowing shell, I think I was able to learn from what I saw and exhibit more selflessness for my teammates. That meant better focus with coming to practice ready to go, more effort to reach out and mentor younger guys on the team, and better ability to dig deep during a tough piece. Another important thing I learned that made me a better rower was that the human body can take a lot of abuse and still perform. 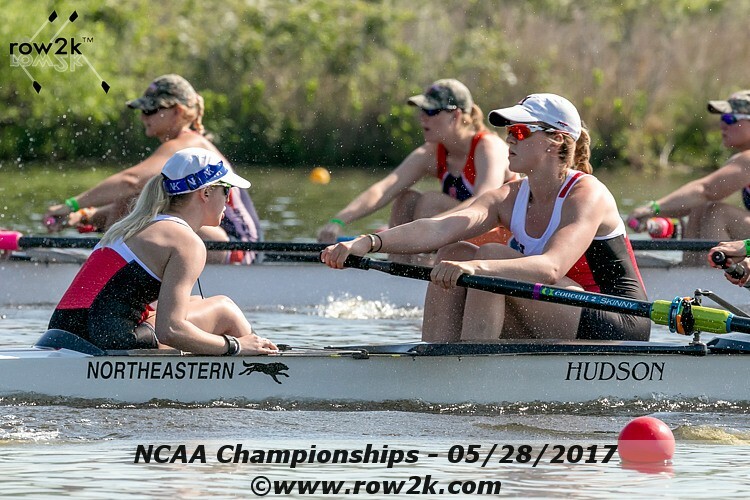 Five months after my body reached its limits and broke, I was back to racing other colleges on the water with my team. I know my body better now, and I’m able to push myself physically more than I was able to before my injury. I think that aggression and maybe a little bit of cockiness are important traits for a rower, but at the same time, I think rowing well in an eight is also selfless. You have to be able to sacrifice your comfort for your boat-mates and humble yourself to be able to work well as a team. Of all the lessons I learned from my experience, selflessness is the most important. Caleb Robertson - Aside from the satisfaction that comes from being part of a tight knit team, I think my favorite thing about rowing is that it forces you to live in the present. It’s almost meditative that way. I know I won’t perform as well in the boat if I am stressed out about other things going on in my life. My thoughts have to revolve around the task at hand and only that. When I get to the boathouse after a long day, I get to let out some pent-up aggression and focus all my attention onto a single task. There’s something deeply satisfying about that, and I find that I am better able to focus on other things in my life too because of this. Another thing I love about the sport is just the sheer exhilaration I get whenever I get to go out on the water. When I’m in a fast shell with the sun on my face and the wind on my back, I know I’m doing something that I love, and it feels like I’m drinking in life a little extra. row2k - You’re captain this year as a senior, how is your role with the team different now than in previous seasons? Caleb Robertson - I think the biggest responsibilities that the senior class and I have are leading the team through the racing season, reaching out and developing the younger classes, and getting them ready to take on the leadership of the team once we graduate. When I was a freshman and a sophomore, my job was to learn. I looked for older guys on the team with qualities I wanted to emulate and formed mentor relationships with them. As a junior, I tried to start using what I had learned in previous years to reach out to the younger guys. The student body at the Naval Academy is divided into 30 different smaller units, called “companies”, and as a team captain, my rank is roughly equivalent to that of a company commander. Because of this, I am able to work with the student body leadership and advocate for my teammates if they encounter any problems outside of the boathouse. I consider myself fortunate to have a strong senior class that has stepped up to the challenge of leadership and made my job as captain easier. row2k - What are you studying at Navy, and do you have any plans yet for after college? Caleb Robertson - I study history for my major, and I am particularly interested in the history and dynamics of modern conflict and terrorism. Immediately after I graduate from here, I plan on sticking around Annapolis for a bit to help out around the boathouse and help run practices for the incoming freshman. After that, I hope to go to grad school to study international relations before getting started on my career in the Navy.